Captain Marvel Culture: MIRACLEMAN! the Marvelous revival of the British Captain Marvel Rip-Off! (Part 9 of the Blog History of ALL the Captain Marvels! MIRACLEMAN! the Marvelous revival of the British Captain Marvel Rip-Off! (Part 9 of the Blog History of ALL the Captain Marvels! When last we left our hero, Marvelman (the British rip-off/follow-up/substitute to Captain Marvel created by Mick Anglo in 1953), his publisher, L. Miller and Son, had cancelled publication in 1963, due mostly to new competition from American superheroes. In the succeeding years, the company, whose name had been changed to L. Miller and Co. (Hackney) in 1959, faced a variety of adversities as they changed their business several times (including becoming a film producer), and folded in 1974 for an accumulation of reasons. According to The Poisoned Chalice by Pádraig Ó Méalóid, there was no mention of the ownership of the Marvelman character in any document relating to the closing of L. Miller and Co. (Hackney). This will prove to be important later, as we will see. 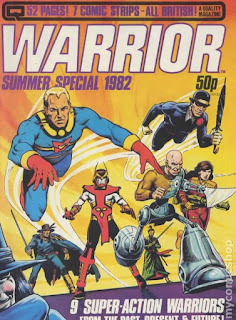 In March 1982, a new British company called Quality Communications Ltd. launched a comic magazine named Warrior featuring several new stories, including a revival of Marvelman. Quality Communications Ltd. had been founded by Dez Skinn, a British comics professional who wanted to create a new monthly anthology comic magazine with a dark edge, and wanted to include a superhero character, preferably a revival. Alan Moore was an English comic book writer who had recently done significant work for the British anthology comic 2000AD and for Marvel UK's line of comic books for the British market. He had become a fan of Marvelman through the 1960's and 70's, reading the old comics, and even envisioned doing a Mad Magazine-style spoof. Alan Moore was given the job of writing this revival, and Garry Leach was the first to draw it. This is generally acknowledged to be the first "post-modern" superhero comic book. Context of the term "post-modern" in superhero comic books: In the comics of the Golden Age (1930's - early 1950's) and early Silver Age (mid 1950's to late 1960's), superheroes were mostly simple creatures, beloved by the public, unburdened by excessive personal problems and existing in a world in which the biggest challenge a superhero faced was a supervillain, not the daily challenges of paying the rent, getting along with fellow superheroes, and negative public opinion. The first "modern" heroes appeared in the early 1960's, when Marvel Comics introduced their new superheroes such as The Fantastic Four, Spider-Man, The Avengers, and the X-Men. With stories and dialog written by Stan Lee and pages of pictures drawn by the likes of Jack Kirby and Steve Ditko, these heroes were more human. They bickered and quarreled, faced practical challenges of relationships and bill-paying, and were not always the "beloved idols of millions." Alan Moore's Marvelman broke new ground in not just considering the personal effects of a superhero career, but also the ultimate, apocalyptic potential of super-powered humans in the real world. The hero and his alter-ego were actually separate people who switched places in a limbo-like dimension through the transformation that occurred at the sound of the word "kimota!" Micky (now Michael) Moran had grown up to be a pudgy, middle-aged schlub working as a journalist who had completely forgotten about his time as a superhero. 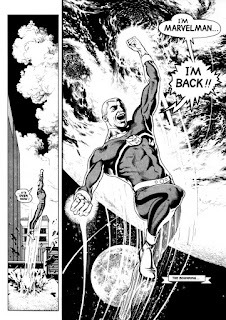 A stressful incident with nuclear terrorists awakened his memory, but the world into which Marvelman awoke was not the one in which he had previously lived. His "mushroom cloud" transformation did physical damage to people and the area around him. His super-strength near-killed every normal human he fought. And it was the tension-fraught 1980's of Margaret Thatcher and the Cold War, not the friendly 1950's of cartoony mad scientists and fictional foreign dictators in which he found himself. The villain turned out to be Kid Marvelman, who had not transformed back to his normal human alter ego in twenty years, and was now a charismatic business tycoon, pretending to be his look-alike alter ego, Johnny Bates. He was ultimately revealed to be a sociopath with the power to fulfill his basest desires by the most destructive means, often graphically depicted. In the meantime, Marvelman's powers seemed to defy the laws of physics. And though he still had a basic underlying personal similarity to Michael Moran, and looked like an idealized, super-fit version of him, he proved to be smarter and more charismatic, and made love to Michael's wife in a fantastically superior manner. The story did not reach its apocalyptic climax in the pages of Warrior, however. Before it got to that point, creative differences and financial difficulties led to Alan Moore and new artist for the strip Alan Davis to cease working for Dez Skinn. The Marvelman strip therefore made its last appearance in Warrior in August, 1984, after 112 pages, and with a cliffhanger. Soon after, attorneys for Marvel Comics sent a cease-and-desist letter to Skinn, claiming that the use of a character with the name "Marvelman" misrepresented Quality Communications as the company that owned the trademark on the word "Marvel" and the name of the superhero "Captain Marvel," Marvel comics. Skinn (and his attorneys) had a lengthy correspondence with Marvel's attorneys, but the days of Warrior were numbered. Its last issue was #26 in February, 1985. NEXT: The Marvelous Miracle! Or was it Miraculous Marvel? Some important parts of the information in this post were drawn from http://www.comicsbeat.com/poisoned-chalice-part-4-intermission-1963-to-1982/, a very thoroughly researched work about the history of Marvelman.